Saturday- Bob left to go to the hardware store. I wanted a plastic corner placed on the slide corner behind my chair. I keep pushing up against the corner and scraping both the chair and the corner. While he was there, he heard, Bob Gray! It was a guy, Jim Gibson, who was a Navy contractor from New Orleans who Bob had worked with on projects before they both retired. It’s a very small world! While he was gone I cleaned up the MH and transferred pictures to my external hard drive. He returned and we made some chicken-vegetable-noodle soup. It was not really cold, but became cloudy and eventually we had thunderstorms. After lunch, we took a nap. We watched the Kentucky Derby, then went over to Kathy and Brian’s MH taking two very excited dogs with us. They had wanted to go visiting all day! We returned to feed the dogs then we went to Grand Lake Brewing Tavern, in Arvada, for dinner. The beer was mediocre, but the pizza was excellent. We had a buffalo chicken with onion and mozzarella with 5 cheese( it was supposed to have blue cheese, but with my allergy, we substituted) pizza. It has a honey drizzle on it which was interesting. We left there are 8:45, traveling home after having a great evening chatting with our friends. Sunday- We did our usual bill paying and budgeting. We had a quiet day at home. We used our new crock pot to cook a whole chicken. Wow, it turned out great! Nice and juicy. It cooked in 3 1/2 hours on high. The Pinterest recipe called for putting four balls of aluminum foil on the bottom, under the chicken. That did not work. They floated. But the chicken was perfect so we won’t waste the aluminum foil again. We cleaned out all the cabinets, getting rid of stuff we do not use. We watched TV in the evening. Nothing special. Monday- We took off early to drop the dogs off for their grooming at Two Lakes Pet Day care, for their 8 AM appointment. It is a nice place. After we dropped off the dogs, we stopped back at the MH. Then took a load of ‘stuff’ that we had cleaned out of cabinets to the Goodwill. On the way back we noticed that on a corner near us a new Walmart Neighborhood Market has moved in. We will look there next time we need to pick up groceries. We stopped at MAC ( Mature Adult Center) for me to sign up to play Mahjongg. We are glad that we did not sign up online. Instead, the guy at the counter did all sorts of stuff. First, I joined for $40 for the year. That gives me complete access. A 20 punch card, which we were planning to purchase, was $42. Plus this gives me a ‘resident’ card. 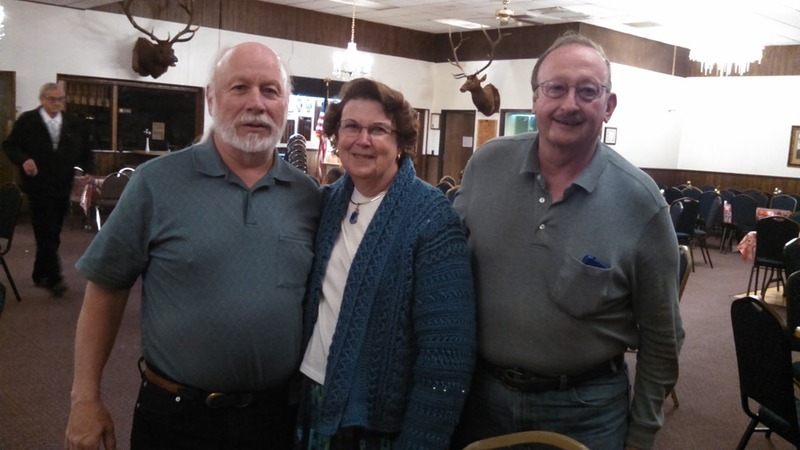 We are able to do this, this year, since the Elks Lodge is now counted as a residence. We just had to show our receipt. Then, Bob was able to get a ‘resident’ card for 2 years, for free. This means if he wants to do anything at the MAC center (including trips), he would pay the resident fee, like I would. He can also go to the MAC center for $2.50 per visit. So next, we ran over to the Library. Since we have resident cards, we could get a library card. We both checked out books. We returned to the MH and waited for the groomers to call. I had Mahjongg at 1, so at 12:15 we headed over to pick up the dogs. They were not ready yet. They were supposed to be ready in 3-4 hours, and this was 4.5 hours. They hustled to get them done and we raced back to the MAC center for Bob to drop me off. It turned out that the time on the internet for Maj was 1-4 and the actual time was 12-3. That was okay, I just joined a game for 3 people to make the 4th. I called Bob at 3 and he came over to pick me up. We did some stuff around the MH. At 5:30, Bob walked over to Brian and Kathy’s MH to see if they wanted to do anything this evening. They already had plans. But, Bob got stuck there as it started to rain, really hard. A nice thunderstorm. He returned a little after 6, we fed the dogs, and ate lasagna from Bucca de Beppo. We were surprised when we opened the package. Usually there food is too much for one meal. Tonight it was just enough. We heated up the lasagna, ate dinner, and watched TV. Tuesday- We woke up to another miserable, cold ( 50’s), rainy day. Ugh! May is the rainiest month in Colorado and it seems to be that way this year. We walked the dogs over to say good-bye to Kathy and Brian. Their slides were already in and they were almost ready to go. 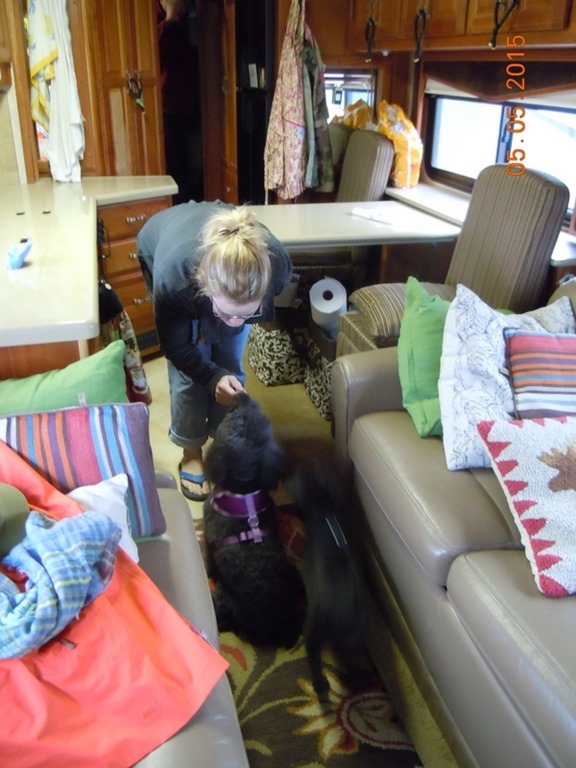 Here is Kathy giving the girls treats. We said a fond farewell, after trying to figure out where and when we are going to meet up again. They will not be in CO again until October, but maybe then, depending upon dates. It was a cold and rainy day. 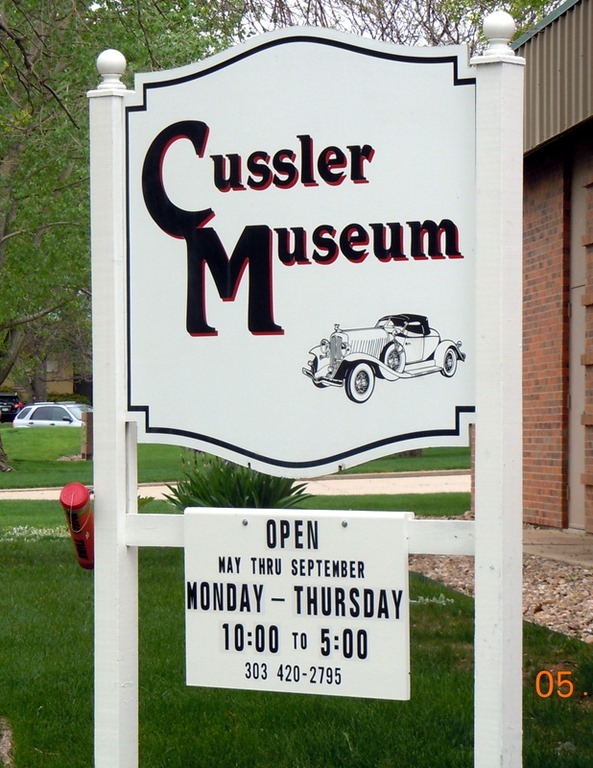 so we decided to go to the Cussler Car Museum in Arvada. 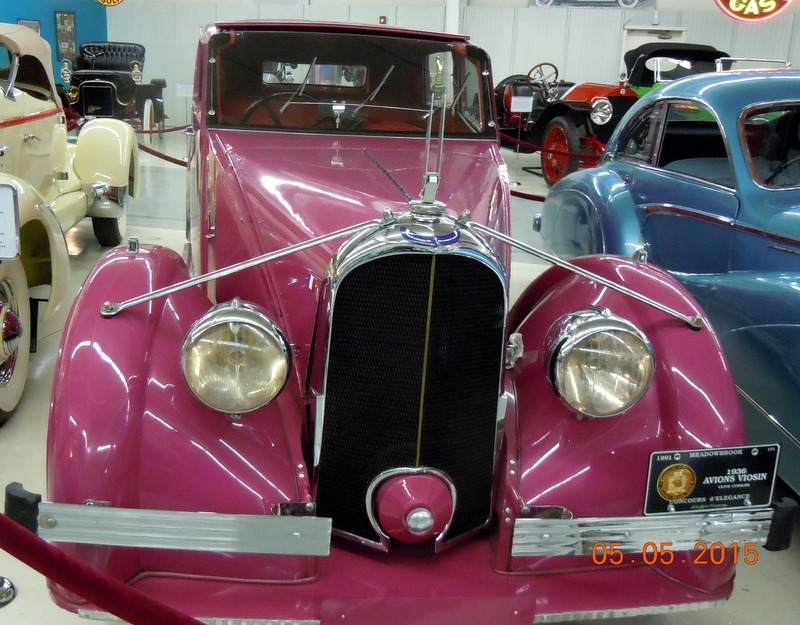 The car museum is owned by author Clive Cussler. We have read most of his books. 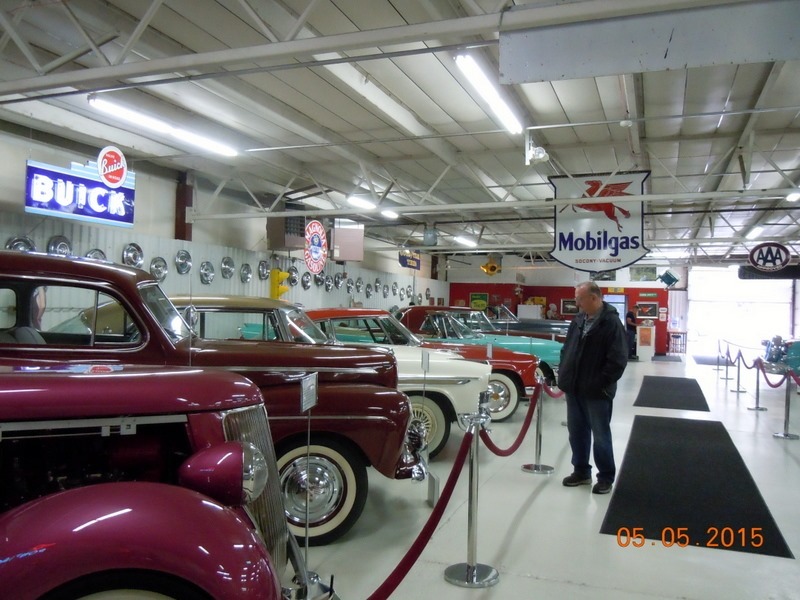 He has a collection of over 100 antique cars. Only about half of them are on display at any time. 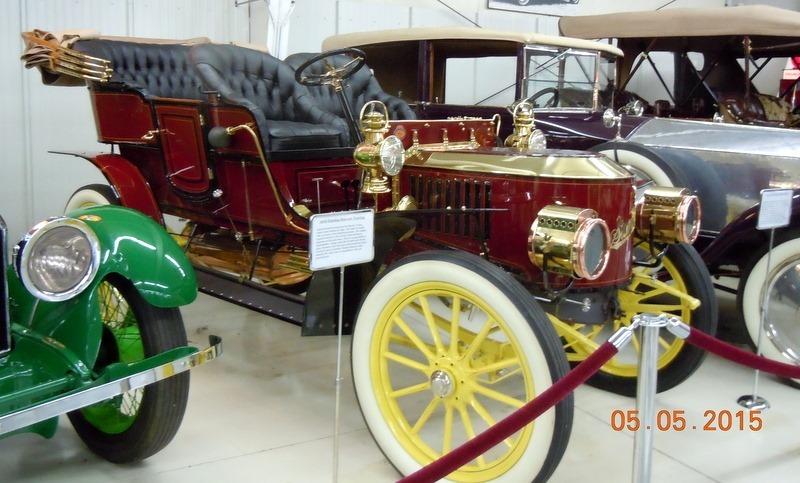 The manager told us that the they rotate the cars yearly, but the cars that have been featured in his books stay on display all year. The cost was $10 for under 65 and $8 for over 65. Above 1956 Monterey Mornea, purchased by Barbara Cussler. 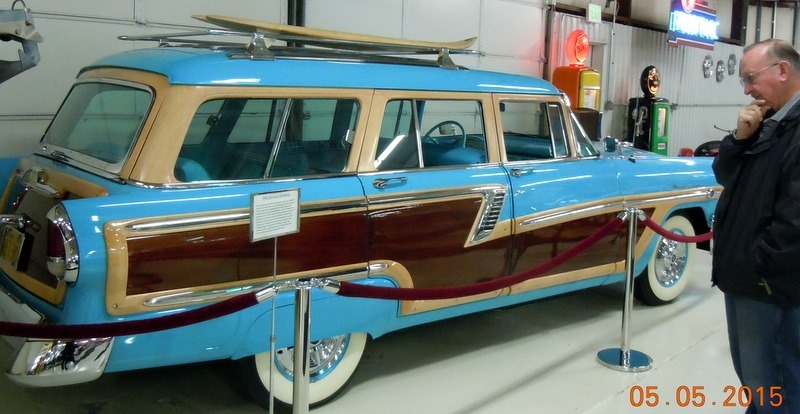 Above, a 1957 Dodge Super D-500 Royal Lancer – a very rare car. Look at those fins! 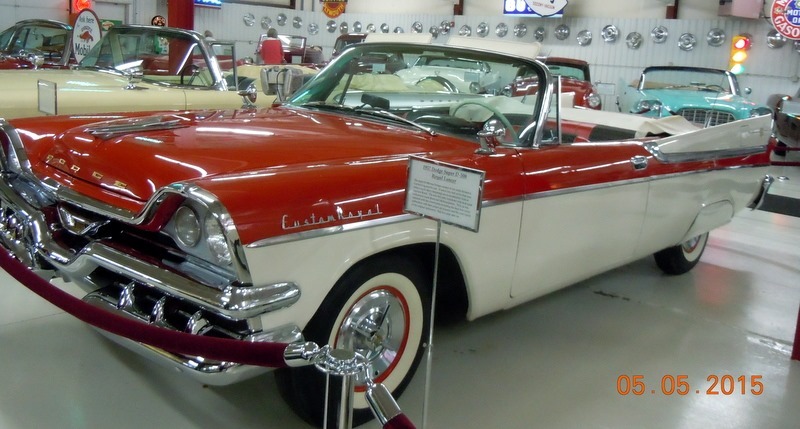 My parents had a 1957 Dodge Coronet which had those fins! 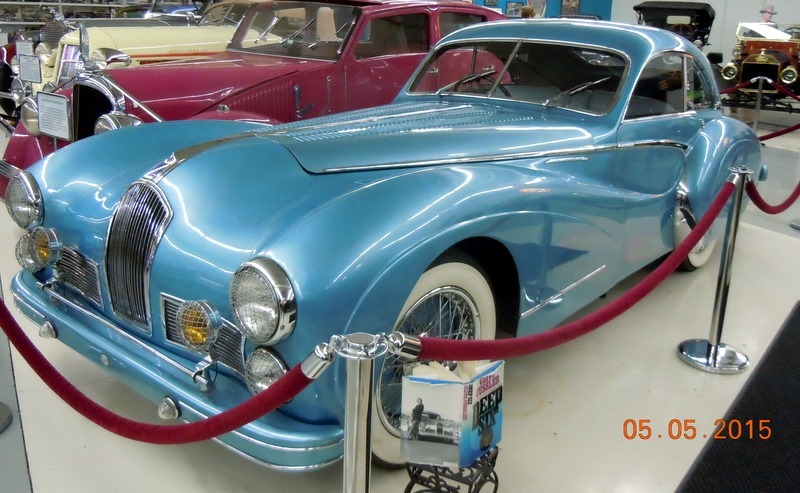 Above, 1953 Allard J2X which was featured in Shock Wave. Above 1953, Meteor, only 25 were made in the 1950’s. 1957 Cadillac Eldorado Broughham. 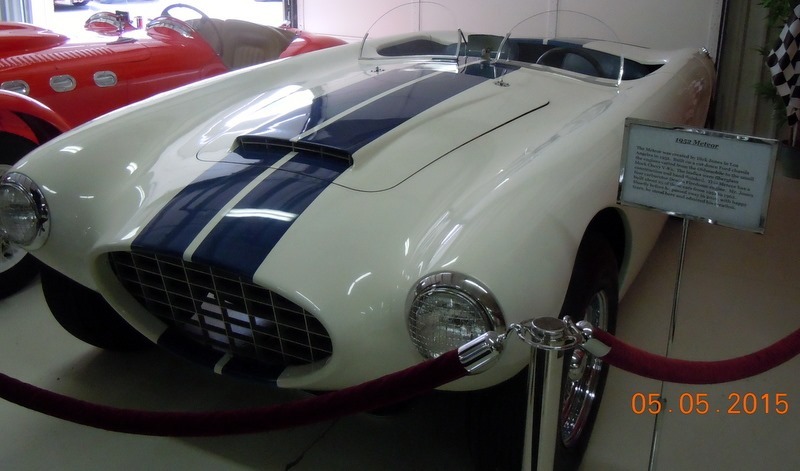 This car sold for $400 more than a Rolls Royce. It has a brushed stainless steel roof, doors which open opposite, air conditioning, heated seats, power steering, brakes and windows. Tinted glass and polarized visors which changed when moved. 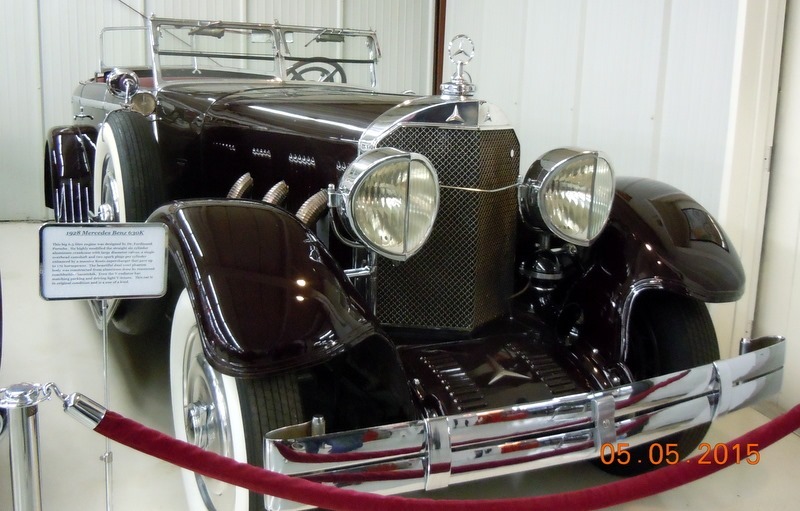 Above, a 1928 Mercedes Benz 630K, this is a one of a kind car. 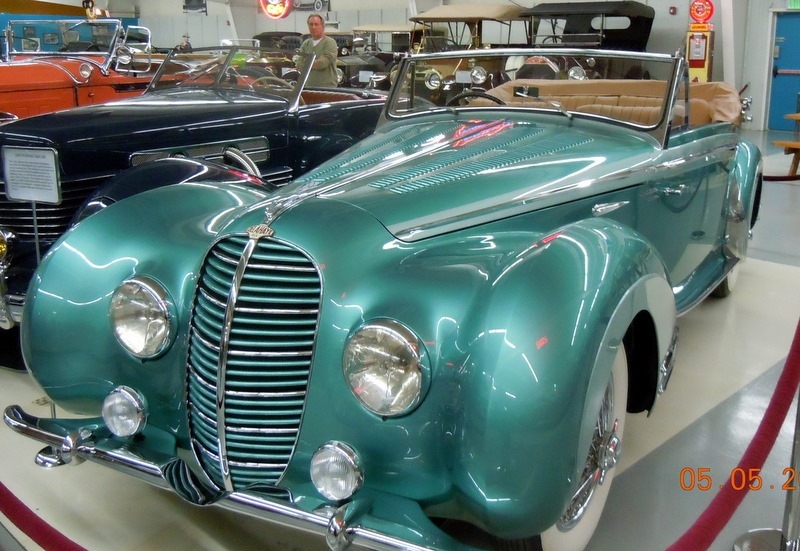 Above, 1951 Daimler DE-36 Green Goddess, in original condition except for the paint. Only 8 made. 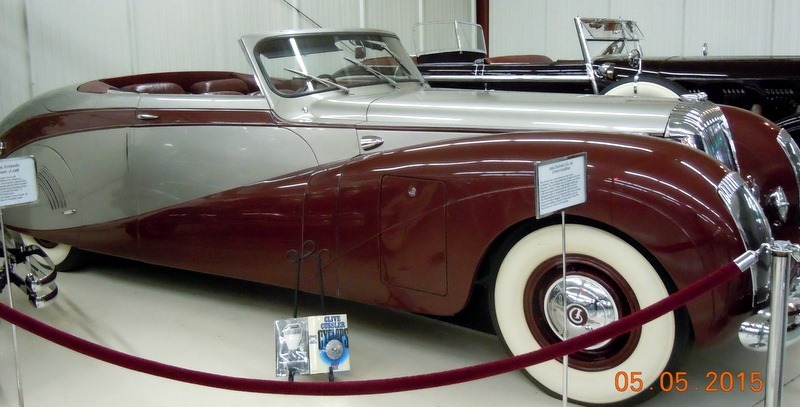 This car was mentioned in Cyclops. Not all of the Green Goddess were green. 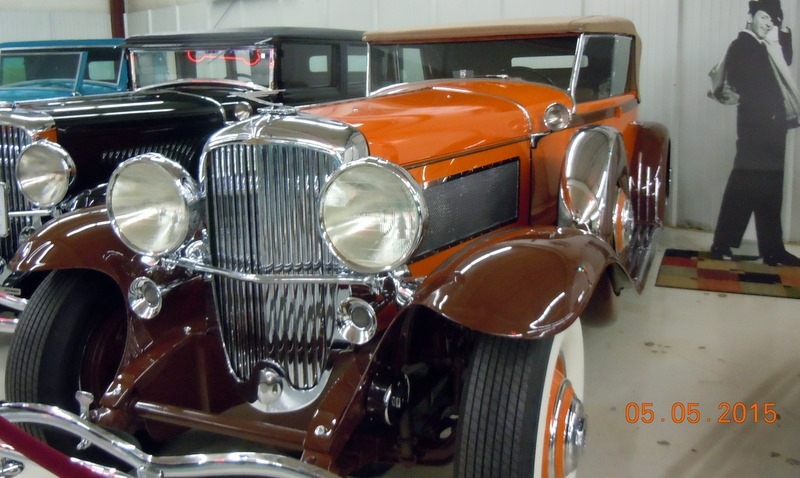 1929 Duesenberg Model J-140. In 1970’s this was a Hot Wheel design. Dirk Pitt drove across Reflecting Pool in Flood Tide. Below is the hood ornament. 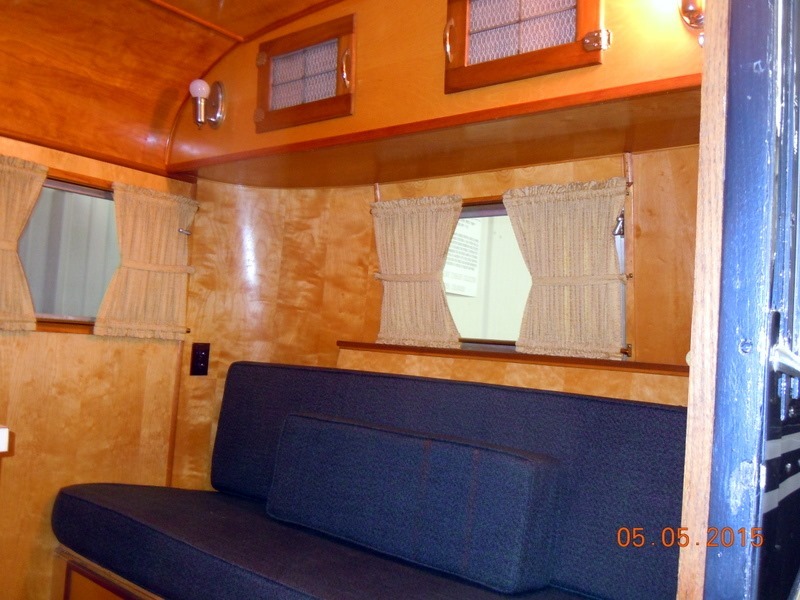 Above, 1937 Pierce Arrow with matching 16 1/2 ft. Model B Dragon travel trailer. 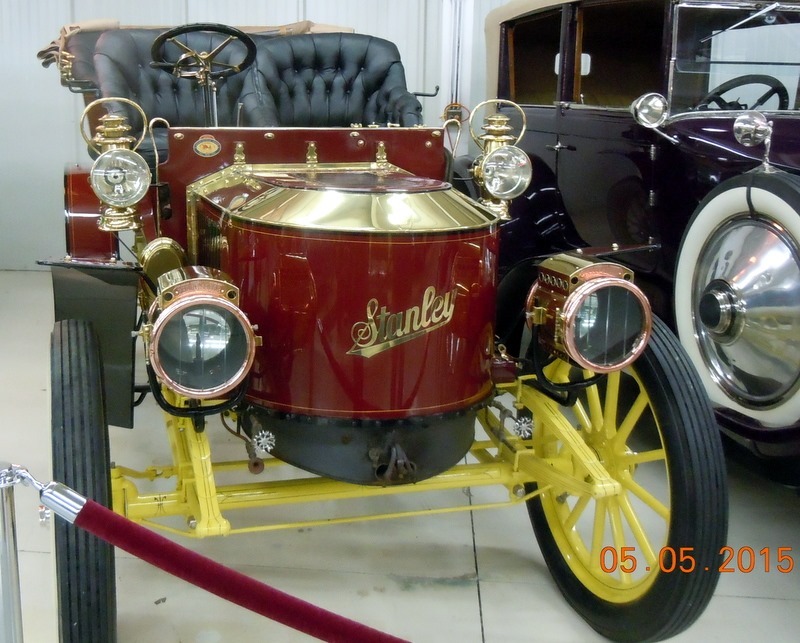 Above, a 1906 Stanley Steamer. Above a 1918 Cadillac V-8 Sports Phaeton. 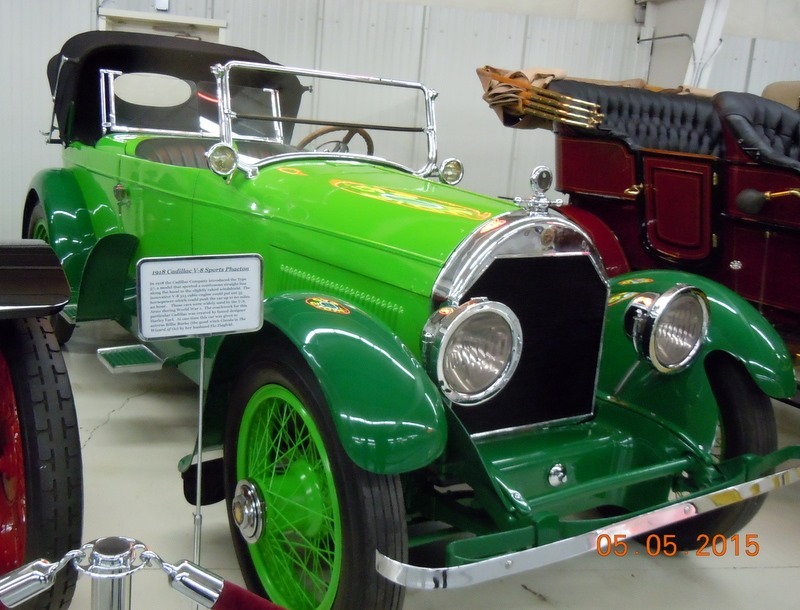 This car was given to actress Billie Burk. Don’t know who she was, well her husband, who gave her the car was Flo Ziegfield and she was Glenda, the Good Witch in The Wizard of Oz! 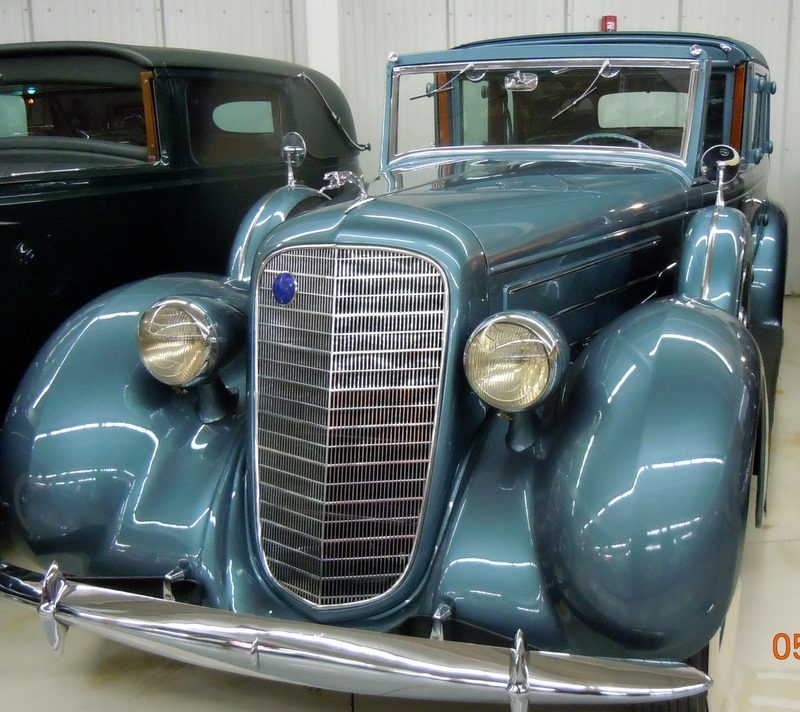 Above, 1936 Lincoln Town Car, only 13 were manufactured. Above, 1948 Talbot Lago Grand Sport featured in Deep Six. 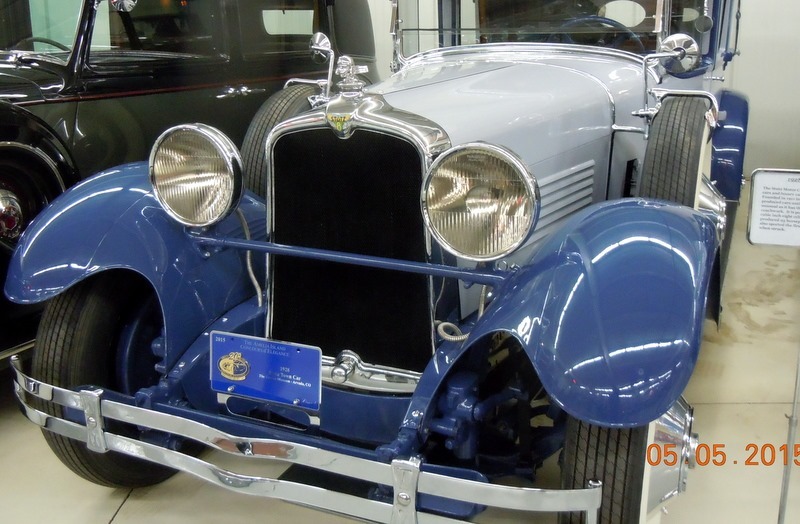 Above, 1928 Stutz Town Car, just won an award in Florida on Amelia Island. Above, 1948 Delahayne Type 135- raced, featured in Crescent Dawn. We had a great time visiting these special cars. There were a lot more there than I have put in the blog. We left and went to Tequila’s Mexican Restaurant for lunch since it was noon and Cinco de Mayo. We had a really nice lunch. We returned home and took a two hour nap. It was raining hard this afternoon. When we woke up this morning Karlie would not eat her breakfast. That is not all that unusual. Roxie had an episode of vomiting before we left. But when we returned it looked like both had vomited on the bed. So Bob took the bedding, except for the sheets, to the Laundromat and I washed the sheets while working on the blog. We ate dinner but did not feed the dogs. We are not sure what is going on with them, but we are giving their tummies a break. They were sad…. we kept telling them they were good dogs and were not being punished. At 7, Bob went to the Lodge for the weekly meeting. It was installation, so he did not get back until 9:30. I read my book. Wednesday- It is still cloudy but they promise us some sun today. I will believe it when I see it. Colorado weather persons are notoriously right. The sun will show up somewhere in Colorado, we are just not counting on it showing up in Westminster! We did some work around the MH, and mostly took it easy. I went to the MAC and exercised on the recumbent stepper. I returned and we eventually went to dinner at the Lodge. We arrived to find a crowd as it was Bingo night. 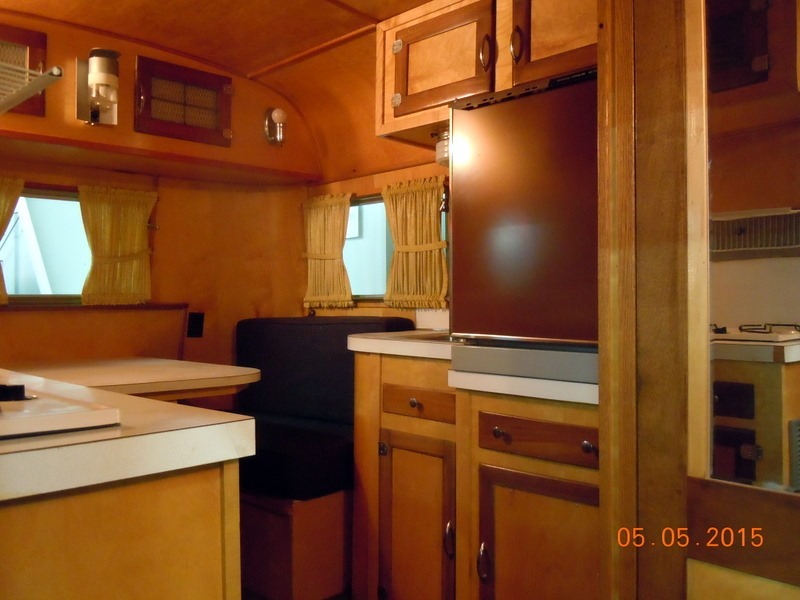 We sat with Marilyn and Jerry, ate a nice dinner of beef brisket and returned to the MH to watch some TV. It continues to be cold and rainy. Thursday- I woke up to find that the spot where the Dermatologist had done the punch biopsy was draining fluid. I had woken up really early so I did a Genealogy Webinar on Legacy. When Bob went to change the dressing he said it really does not look good. So I called the Dermatologist office and they told us to just walk in. We got ready and ran back to Aurora to the office. The Tech looked at the area, took a culture, and went to get the doc. It was a different Doc, Dr. Johnson. She took out the stitches and they sent a prescription over to Walmart for an antibiotic. Before we had left this morning, our PCP( primary care physician)’s office called to say that Bob’s Vitamin B12 was low, so he has to go for B12 injections, weekly for the next four weeks. The Neurologist office called Bob back. and set up an appointment for 3 PM. Bob had been having problems for a long time with dropping items. He was diagnosed with carpel tunnel about 2 years ago, but he now has a slight problem with eye/hand coordination. We returned to the MH and ate lunch. We left to go to Bob’s appointment. We were lucky, as there had just been a cancellation, which is how Bob got the appointment so quickly. The Neurologist, Dr. London, did a very thorough exam. He decided that it is probably the low Vitamin B12. But to be sure, he wants to do an MRI, since Bob is on the Xarelto for the a-fib, he wants to make sure he did not have a small stroke. The MRI was approved before we left the office. He did not think that the problem was the carpel tunnel, which he said was minimal. Friday-We had a really awful night. It continues to be cold and rainy. Karlie woke up sick at around 3 AM. Both dogs also needed to go out, as it had been raining so hard when it was time to take them out right before bed. Bob got up and took them out and I cleaned up after Karlie. I was in a lot of pain from my back and hips. Not sure why, but I had a Chiropractor appt. this morning. He took one look at me and got to work. He did an adjustment, then put on a machine, which he called a Tens Unit on steroids, and he did some acupuncture. I walked out of there exhausted, but out of pain. He told me to walk, and we were going to Costco anyway, so I got in some walking there and at Walmart. We returned home, ate lunch and took a much needed nap. At 4:15, we took Karlie ( with Roxie for emotional support ) to a Vet appointment at Indian Tree Animal Hospital in Arvada. We loved the vet ! We had a vet here in Colorado, but we had such problems with that office that we decided to go elsewhere. We were so glad we did. We should have taken Karlie to the vet a long time ago, as she has had this problem with vomiting for a few years. It turns out she has acid reflux. It is not just a human problem! We arrived home, fed the dogs ( Karlie just had baked chicken) and we went to the Lodge for dinner, meeting up with friends Tom and Marion Braum, who joined us for dinner We had not seen them since Alaska in 2013. We had a great dinner, as it was prime rib night, and a wonderful time catching up with our friends. We talked a lot about Breck catching up on the gossip from there. Marion and Tom are going this summer to the Maritimes. We are looking forward to meeting up with them in Quartzite this winter.